Swimming is an amazing workout. The water soothes your body and takes the strain off your joints, making it a great remedy for muscle soreness and joint pains. Studies show that spending 30 to 40 minutes in a pool at least four days a week can help you shed some weight and tone ‘em muscles. It is also the best way to unwind after a long day at work. Learning how to swim can save your life too. A good number of us live within a driving distance of a body of water and many are the times we may feel the urge to spend the time in the waters. We want to kayak, surf, paddleboard, and do everything else that gets us enjoying the marine world but unfortunately, all these activities can put our lives in danger. If you flip your kayak or fall off your board and don’t know how to get back up, then the only self-rescue option you got is to swim. Imagine how ugly things would be if you don’t know how to beat that water! That’s why taking swimming lessons is important. It is a basic survival skill that everyone should know and practice. Swimming can only make our lives better. Yet, there are so many of us who cannot do it. Good news? Mastering the basics of swimming is easy and achievable for anyone. With a little time and practice, you will be gliding in that water like nothing! So here is a beginner’s guide on how to swim that will give you a firm grip of the workout and get you reaping all the amazing health benefits of swimming. Now, grab your swim bag, throw in your swimsuit and a life jacket and let’s go hit the water! The best time to go swimming would be when the waters are warm and the weather calm. Visit a local swimming pool or find a shallow, calm water body near you. Take your bathing suit, swimming goggles, nose clips, a good pair of swimming earplugs, and anything else you may need to stay safe in the water. Some people bring swimming gloves too just to make their first time more comfortable. Swimming snorkels could also be a great add-on. Don’t forget your life jacket or PFD and most importantly, let someone go with you. The first thing you need to do is to get familiar with the water. Find a spot with calm, shallow water that is almost up to your neck. Take the time to just get in the water and enjoy how it feels around you. Next, practice having your head under water. Start by wearing goggles, and placing your face under the water. Breathing while swimming can be difficult, so make sure you don’t get water into your nose in the process. Have a look around and practice blowing air out through your nose to get water out. Come back to the surface and enjoy how that felt. Repeat this a few times to get more confidence in having your face under the water. Now, try putting your whole head under the water. Being a first timer, you may feel a little discomfort when water enters your ears. But it is still good to try submerging your head without the earplugs so your ears can get familiar with the surrounding. If your ears are a bit sensitive or prone to infection, however, then there would be no harm donning the plugs. Let your head rest for a while under water and then come back to the surface. Tilt it to each side to release the water from your ears. You may need to shake it a little to get the water out. Practice immersing your head until you feel completely confident having it underwater. You are doing great, let’s move on! Treading water is simply “standing” in the water. It is a basic survival swimming skill that keeps you floating in an upright position. You gently use your arms and legs to keep your head above the water. For a person who is learning how to swim, this is a good skill to have, just in case you panic and are not sure what to do next. You can get your head above water to take a deep breath and calm yourself before moving on. To practice treading water, move into an area of your pool or any water body of your choice, and extend your arms out to each side. You are going to alternate between flapping your arms and kicking your legs. Firstly, have your palms facing down and your fingers together. Push your arms down until they are by your side. Lift your legs up off the bottom of the pool and as you start to feel the water pushing you upward, bend your knees and lift your legs up toward your body. As your arms reach your body, kick your legs out and downward, like a frog. Move your arms up your body and then back out to the extended position. Make sure to avoid hitting the bottom of the pool as much as you can when you kick your feet down. Being a first timer, you may find that you kick and flap irregularly or quicker than you should. But the more you practice, the smoother your motions will get, and the slower the rhythm you will need to keep your head above water. Once you are able to do this for at least 30 seconds, move out to a deeper part of the pool, by holding onto the wall or having a friend come with you. Practice making the same motion in a part of the pool where your feet do not touch the water. Keep kicking and flapping until you are able to go at least 60 seconds straight. You are amazing! Keep going. Now, that you can tread water, let’s get you floating on your back. Everyone has natural buoyancy, and if you spread out your arms and legs, you will find a calming experience floating on your back. To get started, move to a shallow part of the pool, where you can place your feet down on the bottom if needed. Place one hand on the wall or have a friend hold you under your back. You want to slowly lift up your legs and open them, while spreading your arms so that your body is in the star-position. Once you feel yourself floating, let go of the wall or have your friend let go of you. Enjoy the calm feeling as you stare up at the amazing pool roof (or wonderful blue sky), if you are outside. There is not much to practice with this skill. Just know that you can do it, should you find yourself in a situation that compels you to float on your back. Awesome work! Shall we start swimming? Mastering kicks is easier than learning arm motions, so we are going to start with the lower body. Find a place in the pool where the water is moderately shallow. Your feet should be able to touch the bottom. Place your hands on the wall and extend your arms, such that you are standing back from the wall. Lift your body in the water, so that your hands are holding the wall, and your body is parallel to the wall. Your feet should be parallel behind you. Let’s begin with the flutter kicks. With a flutter strike, you alternate between kicking with your left leg and your right. These strokes are controlled by your hips, knees, and ankles. When you kick, your leg goes down, but your foot pushes the water backward. You can start with your dominant leg or any leg you feel more comfortable starting with. Point your toes and kick the leg down. Your knee will help with the sharp kick. Remember, you are not kicking your leg all the way down, just enough to propel yourself forward. Keep your toes pointed so that your foot is angled to push the water back. As you bring this leg back up, repeat the motion with the other leg. One should always be kicking down, and the other should always be returning up. Avoid breaking the water with your feet. Both of your feet should remain below the surface and not splash the water. Practice with your feet at different angles, different rhythms, bends, etc. Find the motion that gives the most push forward. You may be using muscles that you have not used before, so if you feel like your body needs some rest, make sure to give it some before proceeding. The more you practice kicking, the more you will build up your muscles. Once you feel confident with your kick, find a kickboard to hold onto and practice a couple kickboard swimming techniques. For instance, move from one side of the pool to the next while kicking your legs. Put your face underwater and practice breathing as you move. The kickboard will make your motion easier and keep your upper body afloat. With the flutter strike out of the way, let’s now get down to a whip kick. This is actually similar to the frog-like kick you did while treading water. It helps you perform a variety of stokes in the water when it comes to the actual swimming. Start in the same position as you did with the flutter kick, with your hands on the wall and your body horizontal in the water. Bend your knees and move them out from the sides of your body, while keeping your legs parallel to your body. Thrust both legs back at the same time until they are back in their original position (legs together and horizontal in the water). You should feel yourself being pushed forward. Keep practicing until you are confident that the kick can push you through the water, and then use a kickboard to try it. Switch between flutter and whip kicks as you move from one side of the pool to the other. Swimming is a combination of arm and leg movements. There are many different swim strokes you can learn to make the activity more enjoyable. 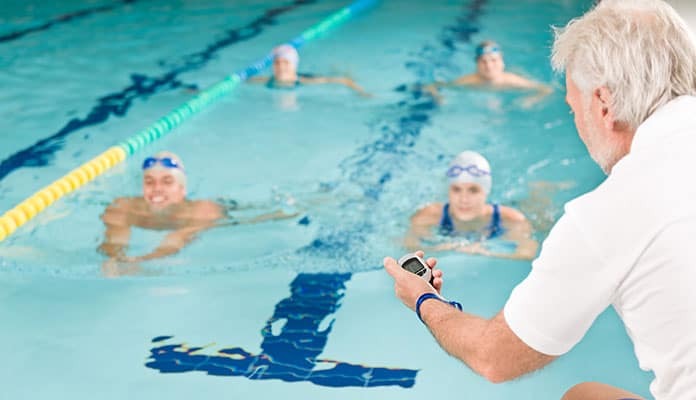 If you want to become an expert swimmer, then you may consider signing up for swim lessons so you can get the benefit of a coach. In the remainder of this article, we are going to discuss the two most popular arm strokes i.e. freestyle and breaststroke. So grab your swim paddles and let’s get this show on the road. Shall we? Freestyle stroke is also known as front crawl, and that is technically what you will be doing. It is the most common movement and will propel you through the water the quickest. If you are surfing and your surfboard gets swept by the water currents, for instance, this is the stroke that will help you get out to the waves. You will be using your arms to drag yourself through the water. The very first motion in freestyle is to throw your arm forward, then down into the water in front of you. Your hand should be cupped as if you are trying to hold water, but with your palm facing down as it enters the water. 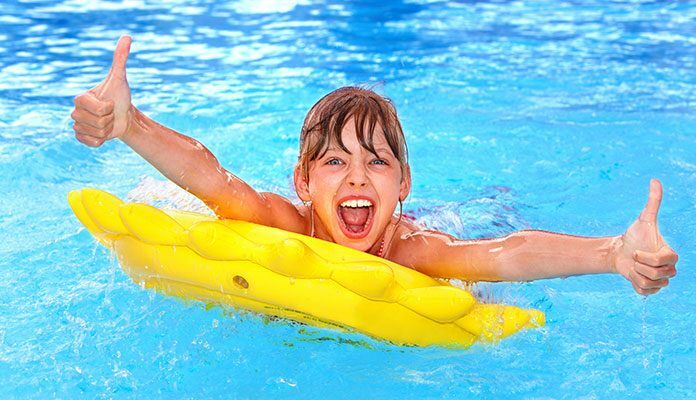 Your arm should enter the water when it is fully extended and must not be angled, to the side or at the shoulder. The side of your body, all the way up to your hand, should form a straight line. Picture a line under the water, just below your hand, and running to just below your shoulder. Keeping your hand cupped, you should draw your hand back along that line. This motion will draw you forward through the water. Once your arm is fully extended backward, pull your forearm forward by bending your elbow and then lift your arm out of the water to begin the stroke again. As you are pulling your arm back through the water to propel yourself, the opposite arm should be thrusting forward to create an alternating stroke. Freestyle stroke should be combined with the flutter kick. You can practice just the arm movements for a while, but adding the kicks will help to push you through the water and keep your head above the surface. When it comes to breathing in freestyle swimming, your face should be in the water. The key is to turn your head to the side when you are pulling through the water. You should take a quick breath in and then breathe out when your face is back in the water. You may want to take a quick breath after every stroke or couple strokes. On your first day freestyling, you may experience swimming shoulder injuries due to the rigorous moves your arms have to make. But you need to stay active and eat right in order to recover from swimming quickly. Breaststroke, on the other hand, is a slower stroke. It is great for times when you need a relaxing exercise. It is also the best stroke for scuba divers and other underwater enthusiasts. We all know how crucial it is for divers to save air when underwater and minimizing movement is one of the best ways to do this. A breaststroke, being a slow move, will get a scuba diver using less energy hence lowering the risk of depleting their scuba tank. The breaststroke is a calm and perhaps easier stroke than freestyle. Here, you will be moving both arms simultaneously and maybe add a few whip kicks to make the stroke more fun. To do a breaststroke, start with your palms together, and your fingers pointed. Thrust both of your hands forward until they are fully extended. Turn your hands such that they face away from each other and cup them slightly. Now push the hands away from each other and continue to move them in that direction so that they draw a circular path in opposite directions from the front to the side of you. You can bend your elbows as you do this. Once you have your arms behind you, draw them in and underneath your body, and then back into the starting position. Repeat the motion as you kick. Alternate between your arms and legs. While your arms are getting back into position, your leg motion should be propelling you through the water, and vice-versa. To breathe in this stroke, start by moving slow and keeping your head above the water. As you speed up, keep your face in the water, and come up to breathe as you pull your arms back through the water. Swimming utilizes la lot of muscles, especially your core. Try to find other workouts that focus on your core, to give you better strength when you are swimming. Jogging and biking will also help in firming up your leg and arm muscles. With time, you will even find adding equipment such as a swim parachute to your training an effective way to improve your muscle endurance. A swim cord will also go a long way in making the activity more versatile. If you run out of breath, then you will have to stop swimming. And if you do not take in enough oxygen, then you will not have enough energy in your body to complete your strokes. Find a good balance between your head being in the water, and it being out to take a breath. If you can keep the same breathing rhythm, your swimming will improve. Swimming in a pool is a lot different from swimming in an ocean or lake. Make sure to perfect your strokes in a pool before you graduate to swimming in a natural water body. Start in the shallows and hone your skills there before you move on to deeper (and probably colder) water. If you just finished your swim lessons, always take a friend (who can swim) with you when heading outdoors at least for the first few days. The combination of the cold, unknown, weedy, or different waters can cause anyone to lose focus. Trust us, losing concentration is the last thing you want to do when you are in the middle of the ocean. As you can see, learning how to swim isn’t difficult at all. If you just follow our instructions, and try hard while you do, you can learn a basic swim stroke in under an hour. All you got to do after that is practice. Taking a splash in a pool will take your workout to an entire new level. From exercising in a pool to diving down deep under the water, you will start seeing the fitness world in a whole new light. It is great for your body and gets you reaping tons of health benefits. Swimming can be an amazing survival skill too especially if you live near a water body. If you or someone else was to fall in, it could give you the ability to save your own life or that of the other person. It is also a peaceful and relaxing activity. There is nothing more soothing than taking a swim in a mountain lake as you enjoy the beauty of nature or diving in the ocean on a hot summer’s day. So, take some time and learn how to swim. Practice as often as you possibly can. Once you have gotten a hang of the strokes, everything else will be a breeze.